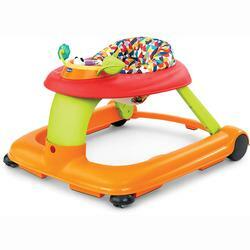 Give baby a place to play at every age and stage of physical development with this transforming activity walker. For babies 6-9 months old who need sit-and-step fun! The Chicco 123 Activity Baby Walker easily transforms from a walker, a push-behind, and ultimately a ride-on vehicle. The 123 Activity Walker features an electronic play tray with bright lights, cool sound effects, and manual activities. The tray can be removed from the walker for use on the floor as a stand-alone toy. Two height adjustments and adjustable handles make it easy to find a great fit for your child. Six brake pads help bring the walker to a stop if heading over a step.